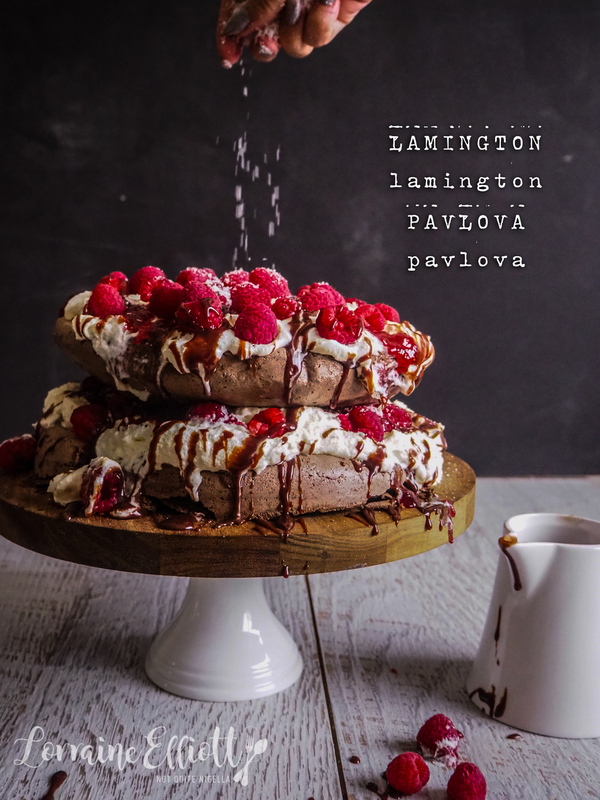 Luscious Lamington Pavlova For Australia Day! Want to make somethings delicious and spectacular to serve this Australia Day? 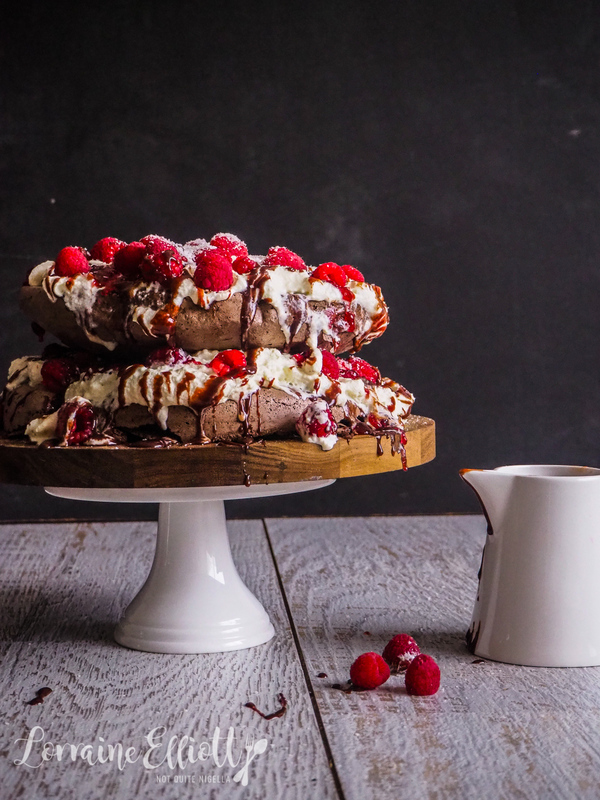 Try this lamington pavlova! I'm living proof that this pavlova can be done under times of stress and it can still turn out deliciously. 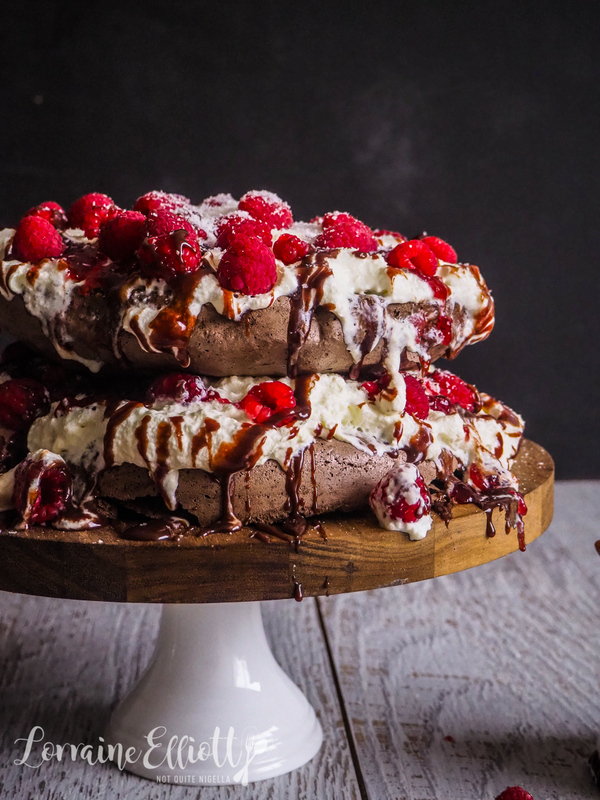 Like its namesake, there are two layers but this time they are chocolate and coconut meringue layers sandwiched together and topped with billows of whipped cream, raspberry jam, fresh raspberries, coconut and chocolate ganache! I called her Pandora. 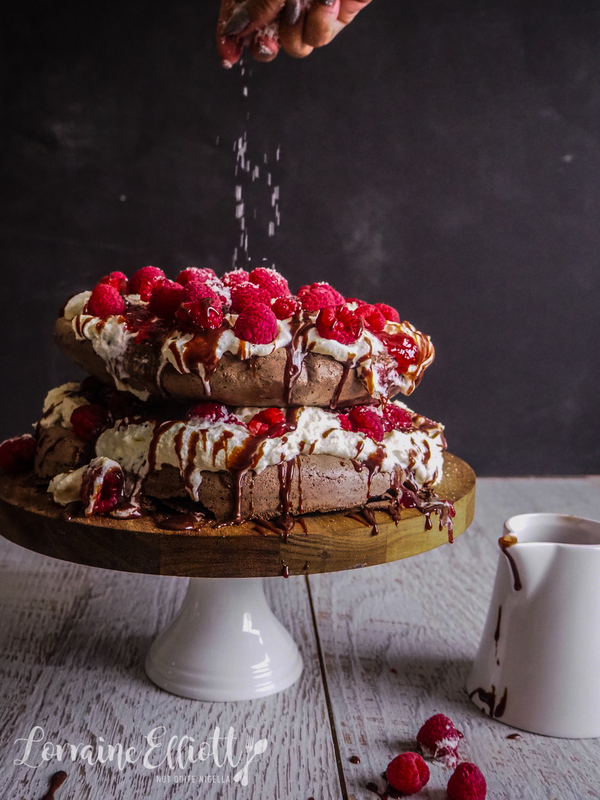 I cannot tell you how much this tastes like a lamington but in a pavlova form so if you love chocolate, coconut, raspberries or lamingtons I'd urge you to give this a try. It's dreamy and well worth making. I'd like to say that this came together with a lot of ease but truthfully I made this while I was having a hellish day. And it was hellish all because of one package. 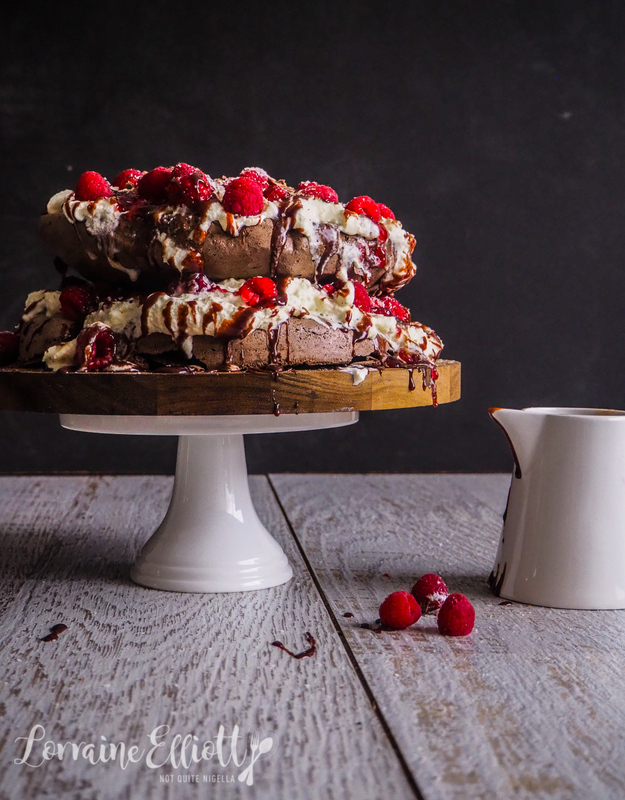 I had visions of shooting this pavlova against a new background. I ordered it a week previously and it just had to arrive from Melbourne. Except there was a delay sending it off and then a delay at the courier. I called the courier company who assured me that it was scheduled for delivery the next day and that it would arrive first thing in the morning. Come 10am nothing had come so I rang and left my name for a call back. And waited. And waited. I even had the world's shortest shower that morning to make sure I was here because as you know, as soon as you step into a shower they'll knock once and run. By noon I was still waiting so I rang the courier and spoke to a young guy called Caleb. "Oh my god, did he just deliver it just then? I can see that he just carded you, literally just then," said Caleb dramatically. "What? No...let me run to the door!" I flung it open while on the phone. There was nobody there, no package or anything. He asked me to hold and then came on the line a minute later, "OK so I just yelled at him and he is going to be there any minute now!" he reassured me. "You promise?" I said hopeful, because at least he was trying to be helpful. Two hours later nothing. I had to start this pavlova because I had to leave for an appointment that afternoon at 3pm. I called again and stayed on hold. It was all rather comical. I had the stand mixer going with the egg whites whipping up and my phone on speaker on hold but the stand mixer was too noisy for the phone even on speaker. So I had the phone pointed at my ear with one hand while adding the cornflour, cocoa and vinegar with the other one. I finally got a hold of someone else called Emily who put me on hold for a few minutes. "I can't get a hold of the driver, he keeps hanging up on me!" she said but she promised to call me back. I had to leave for an appointment and she of course never called me back. When I got back that afternoon just before 5pm there was another completely different package by my door. And when I rang again at 5pm, I got Robyn who didn't do much except for commiserate and tell me that everything that the previous people told me was likely BS as there was no way for any of them to do anything that they said they did. Also it was actually the same courier driver that had left me the other package! She had no idea why he didn't deliver both. She then promised me that someone called Jay would call me (you guessed it, Jay never did). I ended up defeated and whimpering to her, "But you have one job, to deliver...". So no I didn't get the background that I wanted to use for this photo. And the whole thing looks a bit messy because I made this on a hot day that my air conditioner was no match for. But you know what? It tastes incredible. Part of the problem with lamingtons is that the cake itself can sometimes be a bit dry or stale. But not this. It's soft, crunchy, sweet and rich. It serves at least 12 people so it's perfect for Australia Day. Technically you can cut big pieces but it is intensely chocolatey and rich. Just please don't mention the backgrounds...I'm still waiting for them to arrive! So tell me Dear Reader, have you ever been given the run around by a courier? Are you making anything special this coming Australia Day? Do you like lamingtons? Buyer's tip: black cocoa powder can be found at baking specialty stores. 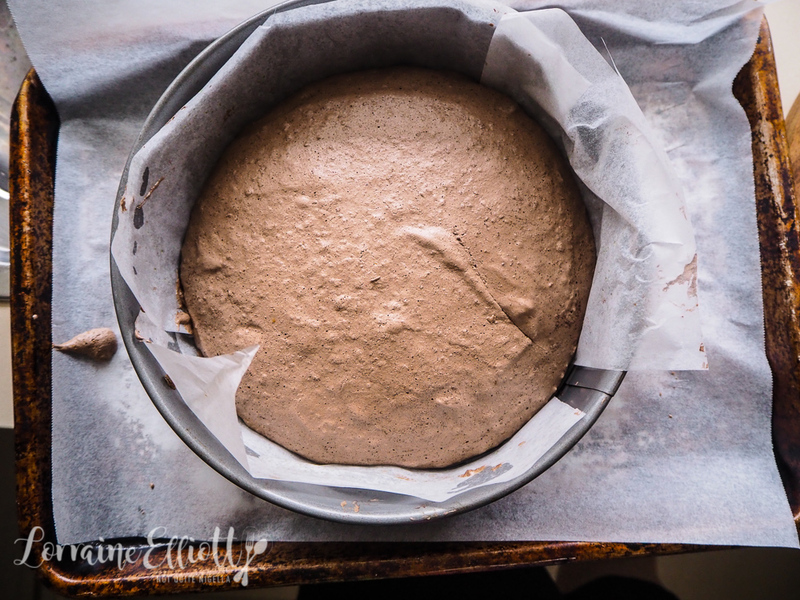 Step 1 - Preheat oven to 200C/400F and trace 2x 20cm circles on 2 sheets of parchment. Take two 20cm/8inch springform collars and line them with parchment and place on top of each circle. Step 2 - Make sure that your bowl and beaters are spotlessly clean and free of oils or grease. Whisk the eggs whites until soft and foamy. Then add 1/4 of the sugar, cornflour, vinegar and cream of tartar. Keep beating adding in the remaining sugar gradually until starting to become stiff. Add the cocoa powder and then whisk until it becomes very stiff-you should be able to tip the bowl upside down and the meringue shouldn't move. Fold in the coconut and then spread out dividing the mixture between the two trays spreading out to the edge of the collar. Step 3 - Place in the oven and reduce heat to 130C/266F and bake for 1 hour and 15 minutes. When baked, turn off the heat and let cool in the oven. Step 4 - Heat the dark chocolate and cream until soft and stir together to form a ganache. Set aside to cool a bit. Then whip the cream until you get soft peaks (I don't add sugar as there is enough in the meringue, jam and sauce). 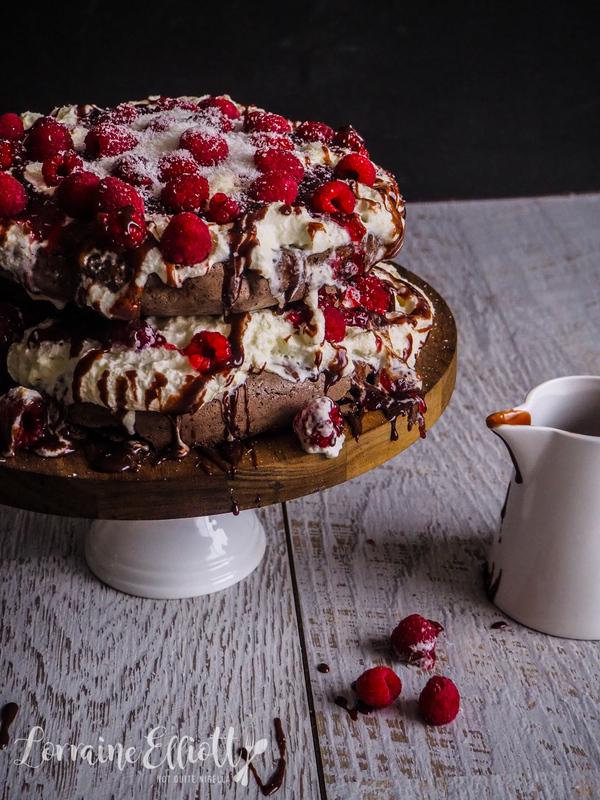 Spread half the cream on top of one pavlova and then top with half the jam, ganache, coconut and raspberries. Repeat finishing with the remaining cream jam, ganache, coconut and raspberries. Serve immediately (or as soon as possible, I don't mean to alarm you by saying that it needs to be right then and there). recipeKylie, The Iced VoVo Pavlova for Australia Day! recipeHaving A Triple Layered Golden Gaytime Pavlova! recipeA Very Australian Shaped Pavlova For Australia Day! recipe Kylie, The Iced VoVo Pavlova for Australia Day! recipe Having A Triple Layered Golden Gaytime Pavlova! recipe A Very Australian Shaped Pavlova For Australia Day!